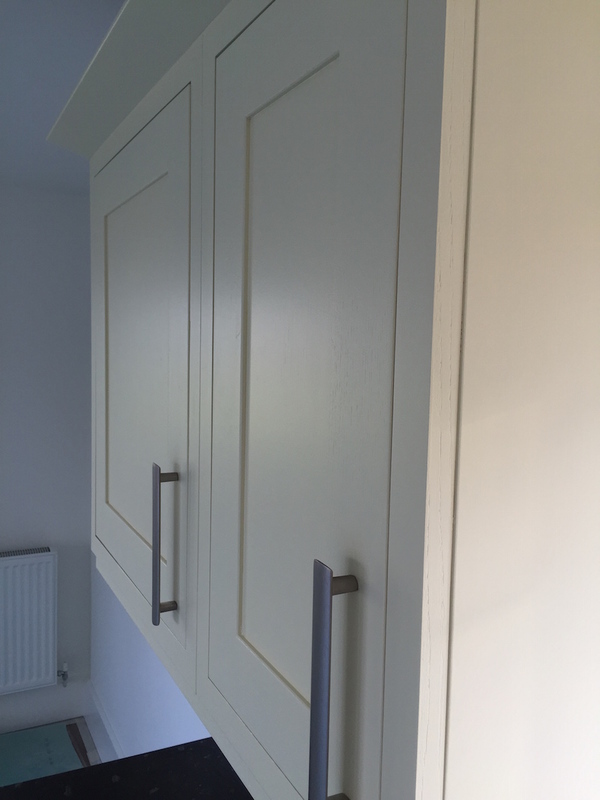 This Traditional Painter, Hand Painted Kitchen in Gloucestershire falls outside my usual working area of the West Midlands… My clients came to me after conducting extensive internet-based research – they approached Traditional Painter saying that they had a solid wood kitchen that needed to be painted. 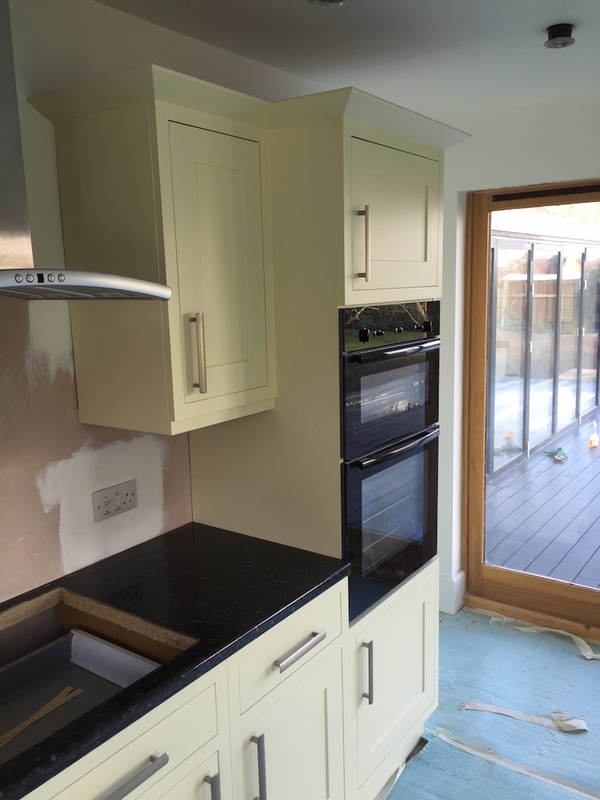 Unfortunately the Traditional Painter Member for Gloucestershire couldn’t undertake the project within the timeframe and so put it to other Traditional Painter Members to see if anyone could accommodate it, as my (now) client was adamant that she needed Traditional Painter to look after her project! As ever (thankfully) I am extremely busy, but, I’m never one to refuse a project – if I am able to help! I was told that my client had builders working at the property and that the kitchen area would be available for me to work in, unhindered… I took a look on Google Maps to find the property location and had that image in mind on. Now, Google Maps showed a lovely looking house; the type that is built at the centre of the plot. I saw a beautiful Cotswold Stone facade, a good sized family home, by the looks of it. On day one I arrived “on site” to find that the facade was the only remaining original part of the property that had been retained and that an extensive six bedroom development had been constructed to a very high standard behind it. 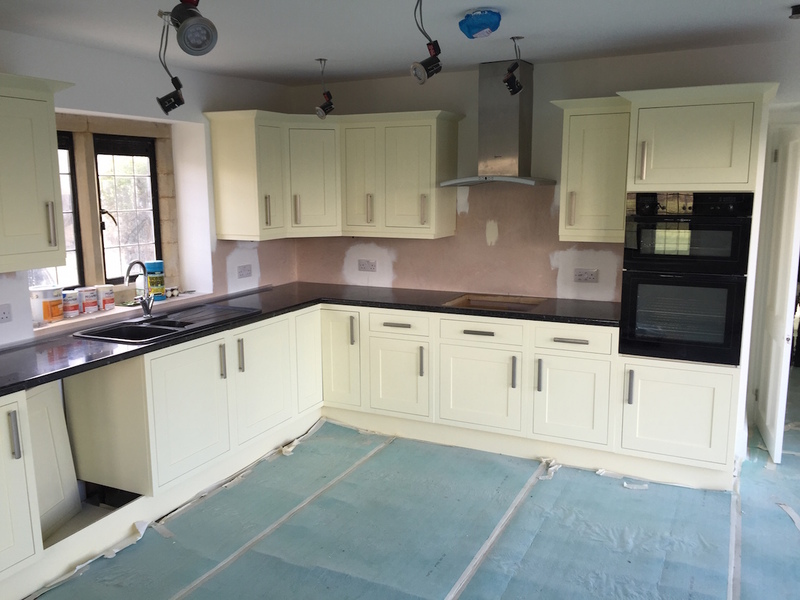 The finish was so high that unfortunately my client’s budget had been stretched considerably… so much so that they had decided to keep the kitchen from the original house and treat it to some well required TLC. 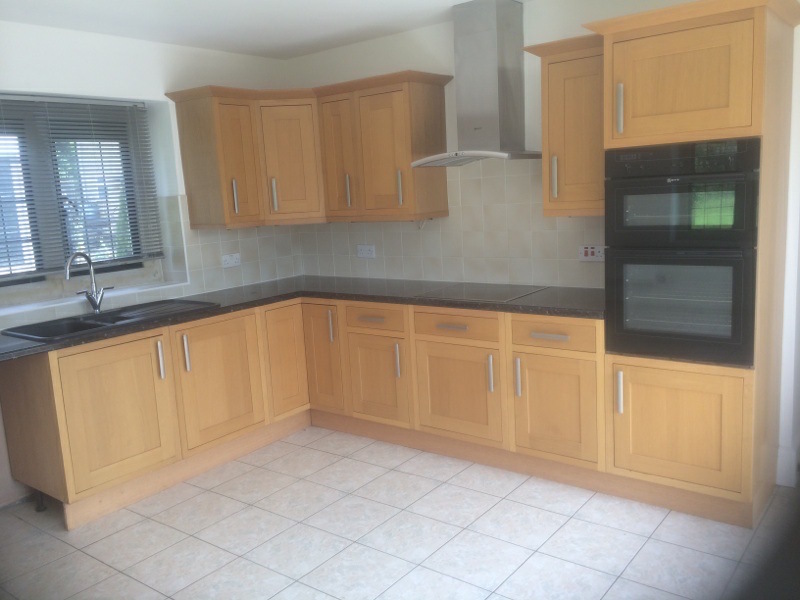 The kitchen (I believe) is a B&Q model, predominantly solid wood with some laminate panels. it was a little tired and definitely not to my client’s taste. 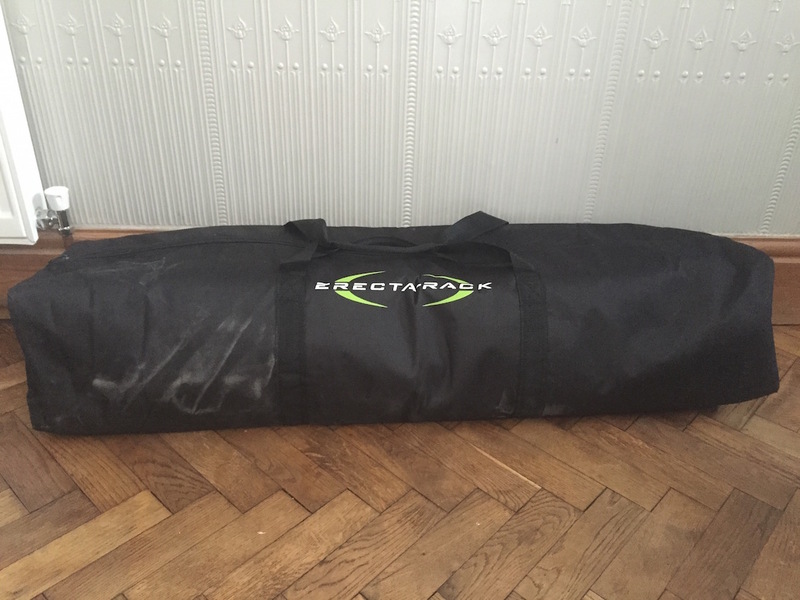 My tried and tested method was set into play; I degreased with my preferred products (*Fluxaf Pro Clean) and “denibbed” with my “Dust-free” sanding system (based around my Festool Extractor). All doors were removed and door furniture removed… I use an *Erecta-Rack modular racking system to store doors and drawer fronts when being painted. In fact, I decided to purchase a second one, from MyPaintbrush.co.uk for even greater storage upon future Hand Painted Kitchen projects. All paint for this project was purchased from my preferred paint supplier; Holman Specialist Paint. The colour, chosen by my client, was mixed accurately into my preferred Pegaprim Isofix and Tikkurila Helmi Matt bases (equivalent to “House White”). 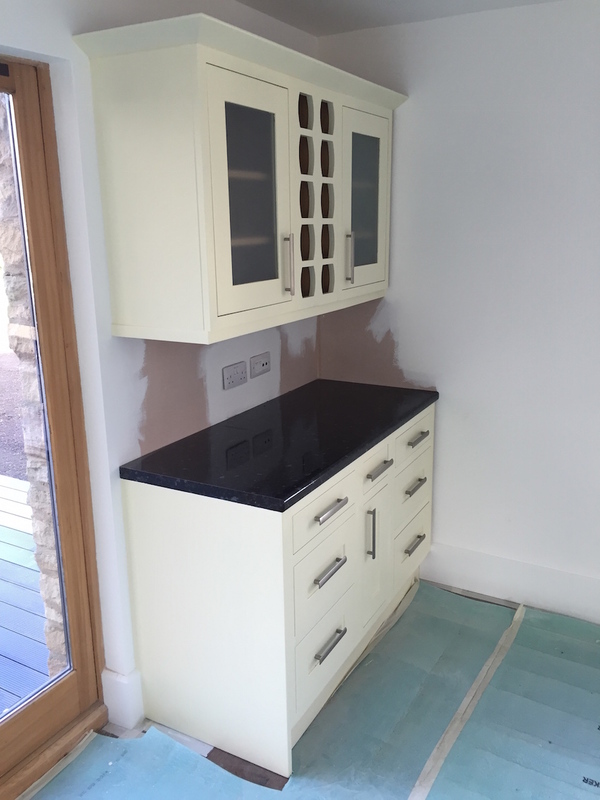 The kitchen now looks like a bespoke, handmade example and sits very comfortably within this gorgeous property. You will see from the photographs that further work is still to be undertaken by other trades… it is preferable that I am the last function of any project – to minimise the risk of damage (and dust), however, sometimes this just isn’t always possible… in order to “hit” the deadline I needed to work out of sequence, hence the floor covering laid down by floor fitter and mist coats on walls ready for paints, tilers, etc. my client’s were aware of this and were happy for me to proceed. This entry was posted in Uncategorized and tagged Erecta-Rack, Festool Dust Free, Gloucestershire, Hand Painted Kitchen, Holman Specialist Paints, MyPaintbrush, Pegaprim Isofix, Tikkurila, Tikkurila Helmi, Traditional Painter, West Midlands on March 24, 2015 by mjguestltdblog.